Hala, bira! Viva, Santo Niño! New Year, New House... Happy Family! I had been to Angkor Wat 3 or 4 years ago, and still, I am in awe of the temples. There is some kind of mystery enveloping the whole complex. Too bad that despite efforts of the Cambodian government to restore this world treasure, still there are many people who steal these precious artifacts, and, in effect, destroying it. 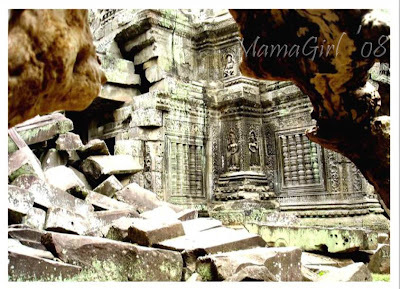 The photo above shows the extent destruction and also shows how far the Cambodian government needs to go to fully protect its national heritage. This is an amazing image. It is indeed a shame that people steal artifacts. Before long, there will be nothing left from which to assemble a story. I hope there is a transformation here soon. You can never go wrong in Angkor! Wished my photos were not lost to my pc crash last year:( My Wordless Entry is up as well ;-) Happy Tuesday! That is a beautiful photograph of the ruins. Oh thats interesting! Happy WW! It's too bad their not willing to restore them. Very cool....Id love to see something like that some day:) Happy WW. My WW meme influenced by Oscar nominee Ruby Dee. Great shot you have here. Happy WW! God bless! Sad case that ppl would steal artifacts.. Happy WW!